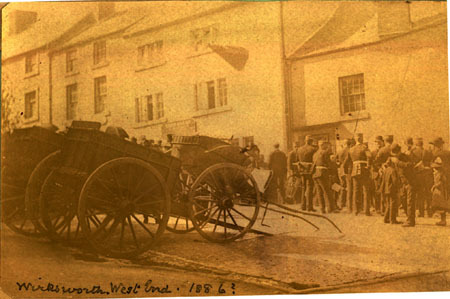 The remaining two photographs of Brenda Pearson's selection from Elizabeth Nowell-Usticke née Wright's album were taken in West End, at the top of Market Place in Wirksworth. Image 3 - Wirksworth West End 1886? This image shows three parked carts, or gigs (l), and a group of band members taking a break (k). 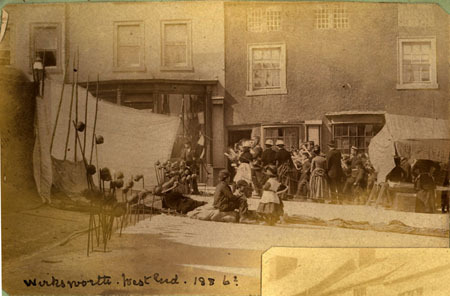 Image 3 - Wirksworth Tap Dressing West End 1886? With regard to the dressings, Mrs. John Cooke, of the West End, again suceeded in carrying off premier honours, being awarded the first prize of 10l. for an elaborate erection, of a much more pretentious character than any of the others. ... although the detailed description doesn't quite match with what we can see in the photograph. Part of a parked gig (l) seen in the previous photograph is in the right foreground of this photo. A small group of people, one woman and a child sheltering under an umbrella, are looking at the tap dressing. Some children (n) are playing on the pavement in the left foreground. The third photograph in the series of the Wirksworth Tap Dressing festivities appears to have been taken from somewhere in front of Coldwell House, on Coldwell Street, looking roughly eastwards across St John's Street onto the Market Place, with Dale End disappearing off to the right. This facade, although it has been somewhat modified over the intervening years is still recognisable from the elevation drawing of numbers 6 to 11 Market Place on John Palmer's Wirkworth site, in particular the semi-circular window on the top storey of the tallest building. In the right foreground, the iron railings appear to be in front of Coldwell House, immediately adjoining the corner of The Red Lion (e), which is the tall brick building on the right. Most iron railings in Derbyshire were removed during the War for the manufacture of munitions (at least this is what my father told me some years ago). None are shown on the elevation drawing of The Red Lion and Coldwell House, or are apparent on the satellite images, so presumably they have indeed gone. 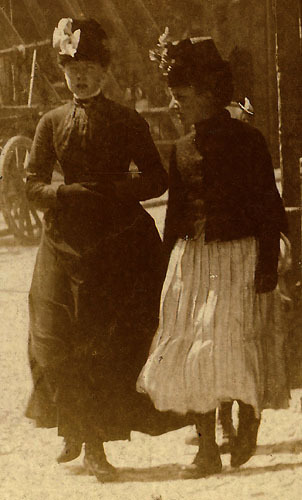 The two young women walking towards the photographer are dressed fairly typically for the mid-1880s. One of them appears to have noticed the camera, and is unsure whether she should be posing or not; the other is still deep in animated conversation, or perhaps she is fascinated with whatever is on offer at the stall on the other side of Coldwell Street, in the left foreground of the photo. (f) Up against the buildings on the far side of Market place are the frames of the swings. At first I thought they might be "swing boats," which were popular fairground attractions at the time. 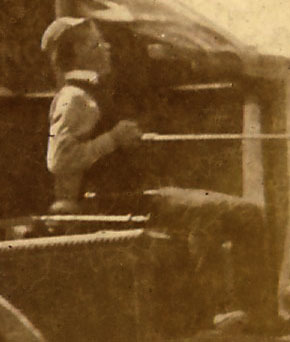 However, the poles of the frames don't seem to be substantial enough to hold swing boats and, besides, if one looks carefully at an enlargement of the photograph, it is possible to just make out a boy, presumably standing on some type of platform, and about to set off on the swing. Immediately in front of the swings, and directly behind the head of the dappled white horse, is the end of one of the show people's caravans, and what looks to be some kind of water tank, although the platform on which it sits is hidden, partly behind a tent, and partly by the horse. To the right of the horse is a parked cart or wagon, perhaps used for transporting the fairground stalls or rides. 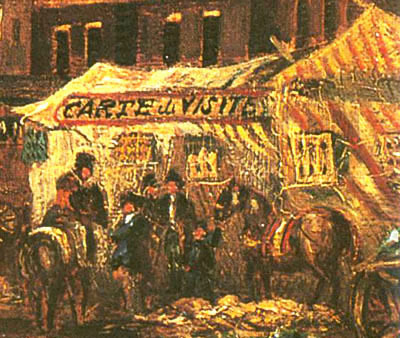 The tent situated behind the horse and cart (g) is a shooting gallery, as shown by an enlargement of the sign in the entrance, but I've not been able to make out the name of the proprietor - perhaps it is something like "..OLE SHOOTING ..."? The 1891 Census list of showpeople on the Morledge, given in a previous post includes several shooting galleries, including one owned by Charles Warwick's mother-in-law, Emma Sketchley (and Arthur Ashmore, William Howell & Frederick Pemberton), and a "travelling rifle saloon" operated by Albert Hall. (h) The teenage boy driving the horse and cart are great fun. He is using the weight of his body to pull back hard on the reins, trying to keep the horse going in the right direction, or to prevent it from going too fast; you can almost hear him crying out, "Whooooaa boy!!!" Also of interest is the cart itself. From the presence of rivets along all the edges, most easily visible immediately below the driver's seat, my interpretation is that it is made entirely of metal. A rectangular metal box of this size suggests to me a water cart, and indeed one can see what appears to be water spraying out of the back of the cart onto the road, presumably to keep down the dust. (i) There is another stall to the left of the shooting gallery, complete with awning, but I've only been able to make out what appear to be two large oval mirrors, and little else. 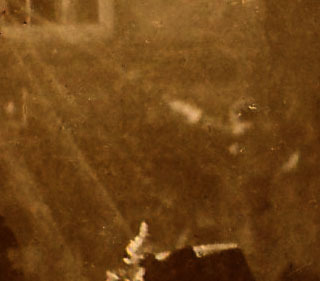 (h) The stall in the left foreground of the photograph, at which two men are browsing, is also difficult to make out in much detail, apart from the three drums at the front. The remaining two photographs will be discussed in post number three of this series. The previous posts about fairground photographers made me think more about fairgrounds and fairground folk in general. I recalled seeing some marvelous images of old photographs of fairground stalls on John Palmer's Wirksworth web site, and contacted both John and the original submitter of the images, Brenda Pearson. They have kindly given their permission for me to reproduce the images here. Brenda's photographs actually come from an album which belonged to Elizabeth Nowell-Usticke née Wright, daughter of a Wirksworth wine and spirit merchant, who was married there in 1889. 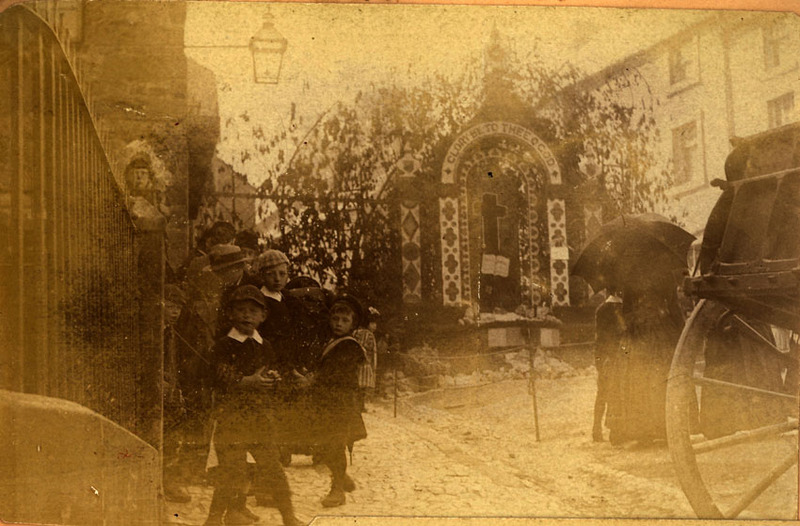 They are a series of albumen prints, possibly taken by an amateur photographer, and labelled with the date 1886. The festivities in Wirksworth were described in an article which appeared in The Derby Mercury on 23rd June 1886. 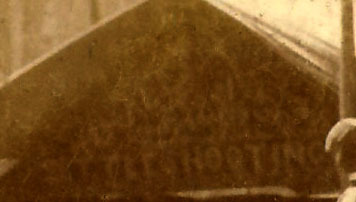 They appear to have been centred around the Wirksworth Tap Dressing festival, which is featured in two of the photographs, and appears to be similar to the well dressings which still take place elsewhere in Derbyshire. WIRKSWORTH TAP DRESSINGS.This ancient festival, a popular gathering with Derby people as affording an opportunity for an agreeable holiday, took place as usual on Whitsun-Wednesday. The custom is one that springs from the Romans, who dressed their springs in adoration of the God of water, and its celebration appears to be peculiar to Derbyshire, as in no other county that we are aware of is the ceremony kept up. As far as more modern days are concerned the Wirksworth Tap Dressings is one of the oldest festivals on record. The celebrations were discontinued for some years, but about 18 years ago the custom was revived, and now forms one of the "red letter" days in the calendar of many Derbyshire people. Of course a great deal depends on the weather, and a cloudy and threatening sky after the many variable days we have lately experienced, prevented numbers of people from taking advantage of the reduced fares offered by the Midland Railway Company as an inducement to enjoy an outing, but in spite of that three or four long trains, heavily laden, landed their living freight at Wirksworth, all from Derby. This was exclusive of excursions from Nottingham, Sheffield, and Burton, besides visitors from the neighbouring villages. On the whole, however, the number of visitors was put down as rather less than usual - wholly on account of the atmospheric conditions. A casual visitor, however, would be unable to draw these invidious comparisons. Crowds of visitors thronged the old-fashioned little town, and made it wear an animated appearance, such as is only observed once a year. The inhabitants themselves appear to view the festival more as a matter of business, and everybody seems prepared to turn an honest penny in some form or other. Providing tea for visitors was the favourite mode, but this business was sadly overstocked, judging by the flaming red and yellow bills in the window of almost every other house setting forth that "accommodation for tea and hot water" was to be had within. The band of the E (Wirksworth) Company D.R.V., and the Wirksworth Brass Band, furnished music during the day, and conducted visitors round the town. The grounds at the Lees were kindly placed at the disposal of the committee by Mr. W. Sealy Fisher, and there a gala was held, the amusements consisting of selections of music by the Wirksworth United Band, performances by a troupe of minstrels, known as the Black Diamond troupe, and dancing on the tennis court, to the music of Mr. Hollins's (Derby) string band. This proved a great source of attraction at the gates. In the Market-place were assembled the usual contingent of shooting galleries, shows, &c. With regard to the dressings, Mrs. John Cooke, of the West End, again suceeded in carrying off premier honours, being awarded the first prize of 10l. for an elaborate erection, of a much more pretentious character than any of the others. In the foreground was a small covered fountain, standing on a square base, having four pillars at the angles, each dressed in moss, with moulds of blue pansy petals, supporting four arches in daisy chaff. On the top of the arches lay a tablet in dark moss, on which was a vase with a square base in moss, with stem in scarlet geranium petals and circular bowl in white daisy chaff. At the back was a large Gothic drinking fountain, consisting of right and left bays, with centre piece on which was worked an Oriental design, with a large stork in white daisy chaff, standing amongst herbage and foliage worked on a ground of sarlet geraniums. Over the centre might be seen the words - "Bless ye the Lord," in letter of red berries on a wite ground, and in each bay a large vase in yellow everlastings, containing lilies and sunflowers worked on a green ground of parsley. Mr. A. Hawley, Dale-street, obtained second prize, 8l., for a well-executed representation of an Oriental fountain; Mr. L. Hardy, Tissington, was third with his North-street decoration, for which he received 6l. ; and Mr. John Clough fourth, 4l., for a design in oldwell-street. Prizes were also offered this year for the best street garland, and after a strong competition, the first and second prizes fell to J. Yates, West End, and W. Macdonald, Market-place. All five of the photographs displayed here were taken in or near Market place, shown in this recent satellite image from Google Maps. The first two photographs in the series are of Market Place, taken in a roughly northern direction, and having numbers 4 to 6 (Market Place) forming the backdrop. John Palmer has a more modern diagram showing an elevation of these buildings here. 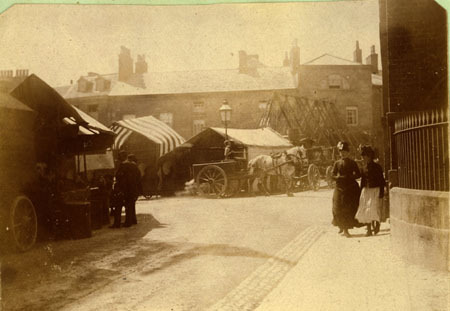 Image 1 - Wirksworth, Market Place, 1886 ? (a) The coconut shy, or "cocoa nut bowling street" as it was referred to in the 1891 Census, is in the foreground, with the coconuts resting in rings affixed horizontally to the ends of sticks. There appear to be two alleys, arranged in an east-west direction, at right angles to St John's Street. (b) The stalls in the middle ground have presumably been set up to sell something, and have awnings to provide a modicum of shade. It is possible that there are trays on the trestle table, containing something like confectionery. One man and four women, including two with children standing or seated on their laps, are tending to the stalls, with their backs to the photographer, but there don't appear to be many customers. At the right hand end of this line of stalls, a seated man and a standing girl, both wearing hats, appear to be tending the coconut shy. He has his right foot on the rail which marks the throwing position for the further of the two alleys. To the right of this, on the eastern boundary of the coconut shy, is another covered stall, with numerous boxes on a table, tended by a man standing with one hand behind his back. In the right hand background, on the east side of St John's Street, are more covered stalls, and a large crowd of men, women and children who are walking, browsing the stalls, or talking in small groups. The buildings on the east side of St John's Street are those shown as numbers 1 to 13 in this elevation drawing. (e) In the background, behind the large lamp post, is the charateristic facade of the Red Lion Commercial Hotel, which still forms a backdrop to modern day Wirksworth, as shown in another elevation drawing on John Palmer's site. 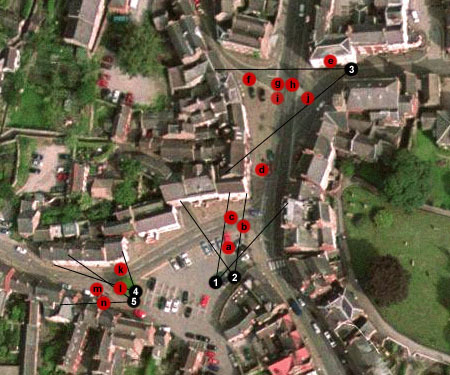 The building immediately to the left of The Red Lion appears, from the satellite image, to have since been demolished. (d) To the left of the lamp post, and largely hidden by the presumed confectionery stall, is what we would nowadays term a merry-go-round, but in the 1891 Census was called a "roundabout [with] horses." The conical roof with a circular plan and a ball at the peak can be seen sticking up above and behind the awning of the confectionery stall, and through the stall part of one of the horses can even be seen. The building to the left of the merry-go-round is number 6 Market Place. Image 2 - Wirksworth, West End, 1886 ? The fore and middle ground of this photograph shows the top end of the two coconut bowling streets (a). Canvas sheets have been erected to catch errant projectiles, held up by long poles and guy ropes extending back towards the confectionery stall, just visible on the right hand side of the photo (b). A group of five children are sitting, lying, and in the case of the youngest, standing, in the space between the two bowling streets. Presumably they were there to put back coconuts knocked from their perches, but at the time the photographer clicked the shutter, they were far more interested in the brass band playing and marching up Market Place westwards towards West End. The band members (c), partly obscured by five adult onlookers standing immediately to the left of the confectionery stall, are marching from right to left across the photo, with some keen children running alongside. In the background are numbers 4 to 6 Market Place. 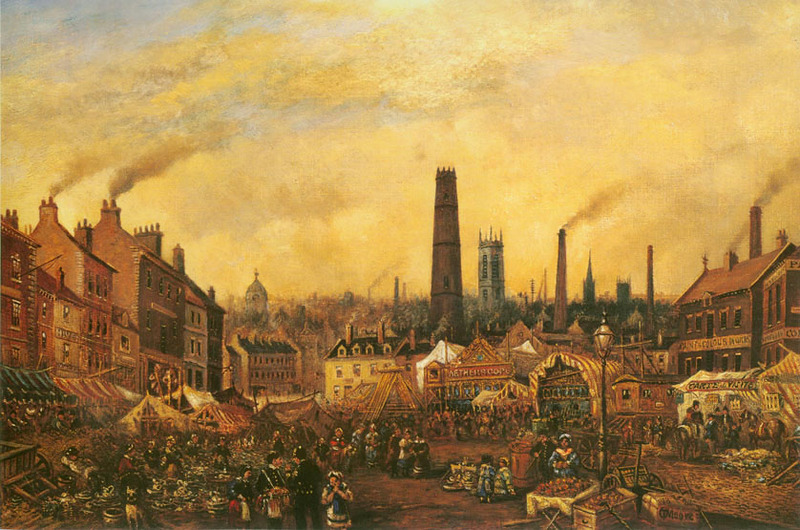 I was in the process of examining the 1882 painting of the Easter Fair at the Morledge in Derby, by C.T. Moore (see my previous posting here), when I spotted the words "CARTE DE VISITES" written on a sign hanging from one of the tents, situated directly in front of the colour works. The tent is a fairly large one, big enough to accomodate the basic accoutrements of the travelling photographer - he is unlikely to have owned many studio props, at least in the way of furniture, and would have made the most of backdrops, perhaps painted, and carpets - and has several windows to let in sufficient light for the potraits to be taken. It is possible that there were skylight-type windows in the tent, although they are not visible in the painting. If the day was fine, and the artist suggests that it is, perhaps he would have taken advantage of the extra light, and had some of his subjects sit for their portraits in an open space outside the back of the tent. He may have developed the pictures in a shrouded, dark area of the tent, or in a purpose-built and kitted out section of his caravan. There is a small caravan parked to the left of the tent, which may belong to the photographer. 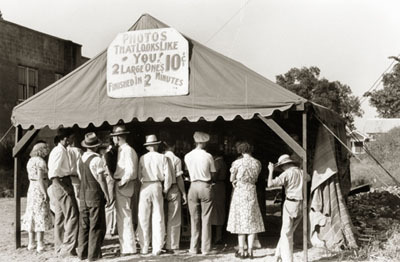 Interested in what photographers' tents and booths looked like in that and later eras, I did a little searching on the net and found several examples. None, however, were clearly identifiable as fairground artists. 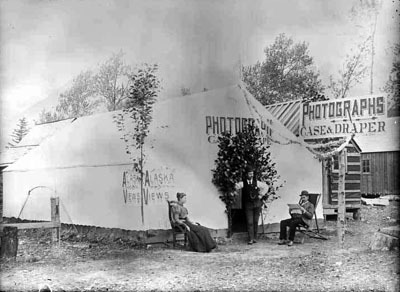 The photographers Case & Draper of Skagway, Alaska had an elaborate setup, with a large studio tent, as well as a separate darkroom building. This one in Steele, Missouri, dated August 1938, might be a little more familiar to those of us who have seen, or even visited, such establishments in our youth. "Photos That Looks [sic] Like You"
Naturally, this discovery also set me off on a mission to see if I could find out who the photographer was, peddling his wares in the Morledge on that particular 1882 Easter Weekend. On census night in 1881, which was Sunday 3rd April, two weeks before Easter, Charles Warwick senior had his travelling van parked on a plot of unoccupied land at 50 Normanton Street, Derby. 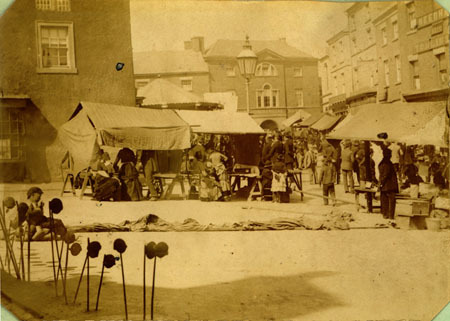 His son Charles, then working as a confectioner, was with a large group of other showmen and women, including the Sketchley family - and more specifically his future wife Harriet Sketchley - at a fair in Market Place and Guildhall Street, Grantham, Lincolnshire. It seems likely that many of the fairground people would have travelled the forty or fifty miles from Grantham to Derby shortly after, in order to be set up and ready in the Morledge for the Easter Fair. ALLEGED OBSCENITY. - Charles Warwick, travelling photographer, was summoned for using obscene language in the Morledge, on the 4th inst., to the annoyance of Elizabeth Doyle, fried fish dealer. - Mr. Briggs appeared for the defence, and as it appeared that nothing was said in the public street the case was dismissed. SUICIDE IN THE FAIR. - A shocking suicide took place in the Morledge on Saturday afternoon. A travelling photographer named George Frederick Whitaker, and his wife attended the Easter Fair, which was held there last week. Mrs. Whitaker, who was a woman of intemperate habits, had been drinkinh heavily during the past week. Her husband, in order that bhis business should not be interfered with, suggested that she should keep out of sight of the public. An altercation ensued between them, and whilst it was going on the husband stopped outside his aravan to hang up a picture. On his return his wofe told him that she had taken some cyanide of potassium - a most active poison, extensively used by photographers. Mr. Borough, of Full-street, was sent for, and administered the usual atidotes, and then ordered the removal of the woman to the Infirmary, but before that institution was reached death took place. An inquest was held on Monday by Mr. Coroner Close, and a verdict was returned of "Suicide whilst in an unsound state of mind." From this article, it is obvious that Whitaker - and his unfortunate wife - had attended the fair, but they may not have been the only photographers there, of course. I know, from later reports in The Derby Mercury, that both Charles Warwick senior and junior, remained in Derby. The father died there in late 1889, at the age of 65, and his son was at the Morledge in 1891. I'd be interested to hear of any other sightings of the Warwicks. I recently received this engaging cabinet card portrait of a young boy from fellow South Derbyshire researcher Hilary Linnington. Hilary told me that she doesn't have a definite identification of this boy, and wondered if I might be able to provide a date, which could help her pinpoint which child in which branch of the family it might be. 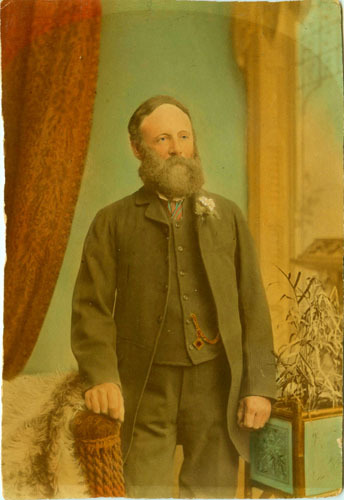 The photographer George Vaughan Sankey (1842-1912) operated a studio at premises in Woodville, Swadlincote and Church Gresley between 1881 and his death in 1912. Unfortunately, I don't have enough of a handle on either the photographer's movements or the changes in card mount designs to be able to infer a date this way. I wondered, therefore, whether an examination of the boy's clothing might help to some extent. Although I am not very knowledgeable about childrens' clothing, I spent some time browsing the pictures in Joanne Olian's book, "Children's Fashions 1860-1912 : 1,065 Costume Designs from 'La Mode Illustrée'" (1994, Dover Publications, ISBN 0 486 27615 5). Although the sailor suit as a choice for both girls' and boys' clothing underwent numerous revivals in popularity from the 1860s until at least the early 1900s, this particular version appears to match most closely an outfit which appeared in "Magasins du Louvre" in 1896, as shown below. I suspect that it may have taken a year or two for this fashion to filter through the smaller towns of the rural English Midlands, and based on clothing alone I would therefore tentatively date it to somewhere between 1898 and 1901. I note also that the item of furniture on which the boy is seated - I hesitate to call it a table, because it is almost certainly a piece designed especially for use as a studio prop - is one which appeared in another of Sankey's portraits, which I originally dated at c. 1892-1895, but which on further reflection I think may have been taken some fifteen years later. 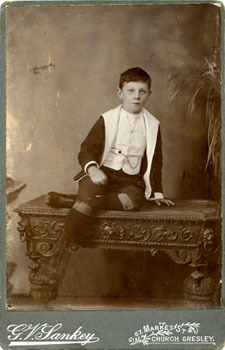 The costumes shown below, taken from the same source as those shown above, are described as sport or travel suits for 12 to 15 year-old boys, and dated 1910. 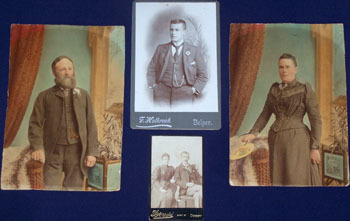 The picture above has a distinctly Edwardian, rather than Victorian, feel to it, both in the design on the reverse of the card mount and the cut of clothing. Although the photographer could have used the same studio props for many years, perhaps the existence of this same item in both portraits by Sankey suggests a slightly later date for the first, i.e. shortly after the turn of the century? I then found a cheviot suit design from 1905, pictured below, which shows many similarities with that worn by the boy in Hilary's photograph, particularly in the waistcoat. This would tend to support a slightly later date of c.1905-1910. 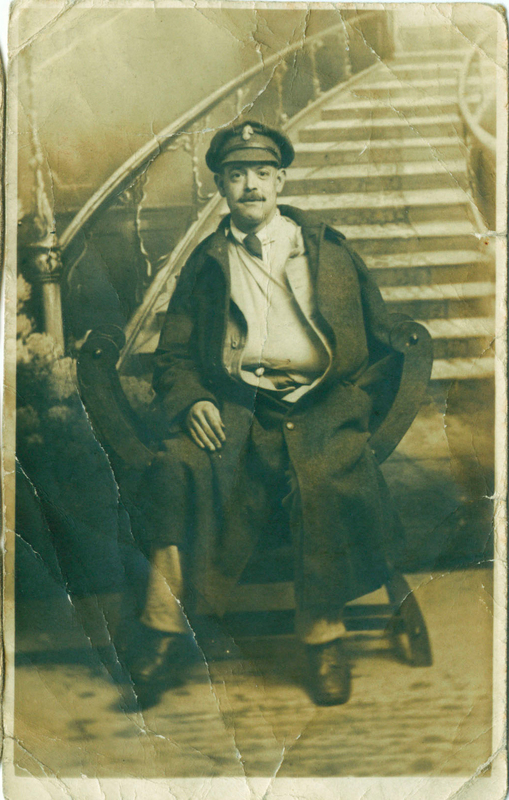 Pat Blackwell recently sent me scans of a couple of entertaining photographs of James Loudon (1863-1931), her husband's grandfather, taken in Derby by travelling photographer Charles Warwick. 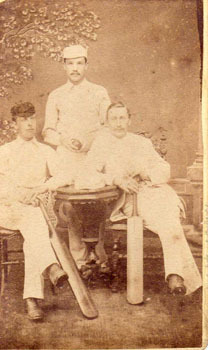 The first carte de visite shows James (standing) with two friends, dressed in cricketing gear, and prominently displaying two bats and a ball. 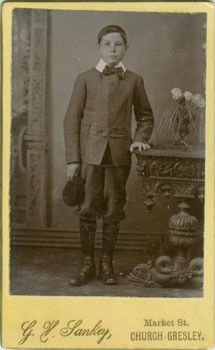 The other cdv appears to have been cut or trimmed from a group portrait, and is an outdoor portrait showing James posing in football gear, complete with football. The elbow of one of his team mates is just visible to his left. "He was born 1863 in Kilmarnock but by 1881 was living in Mansfield Woodhouse, Notts, where he stayed until his death in 1931. He worked for the Duke of Portland all of this time on the Welbeck estate as a clerk and then cashier. From his obituary it states about his cricket 'he played consistently some 40 years ago for Mansfield Woodhouse and the Welbeck tenants.' This would point to him playing cricket in 1891 or thereabouts. My husband believes that [James] played [football] for Notts County as an amateur but we have no proof of that at present. We assume that it would have been about 1883." It seems very likely to me that James Loudon and his fellow team members had their portraits taken by Charles Warwick on the occasion of a match (or matches) against a team(s) in Derby. The cricket and football photos may have been taken on the same day, but just easily they could have been some days, weeks or months apart. Although the reverse of both cartes state, "from London Road, Derby," I suspect that Warwick operated from a booth or something similar on London Road, as I've not found any evidence that he ever had a permanent studio in Derby. 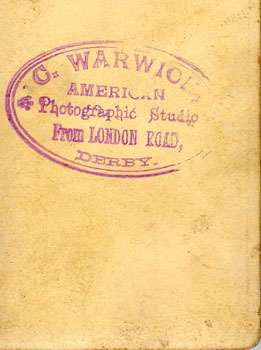 As is common with many travelling photographers, Warwick did not have purpose printed card mounts, but used blank ones, and merely hand-stamped his details onto the reverse. I estimate that the photographs were taken in the late 1880s or early 1890s, which fits well with your statement that he played around 1891. A few years later Warwick did have some card mounts printed for him, as shown by the example in my profile of Charles Warwick and his father, also named Charles. - George Twigdon, proprietor of "Sea on Land"
A short distance away, to the north-west is a cricket oval - you can see this by zooming out and then back in, or panning to the NW - and a team can be seen playing on the ground. It is tempting to assume that John Loudon played cricket as a member of a visiting team on that same ground, and after the match, he and his friends visited Charles Warwick's booth in London Road. Alternatively, perhaps Warwick took his van to the cricket oval, to take advantage of the potential customers among the crowds who would have been watching the match. Artist C.T. Moore captured the lively scene of the fairground and market at the Morledge in early 1882, in a painting - kindly brought to my attention by Nigel Aspdin - aptly titled "Fair Day in Morledge" which was exhibited at Richard Keene's "7th Spring Exhibition of Modern Pictures," reported in The Derby Mercury on 21 May that year. 1896 For highest batting average and acting as secretary for a number of years. Three of the awards are mounted on old cricket balls but the others are not, although they have obviously been mounted on something in the past. Nigel Aspdin found this postcard photograph in the papers of either his paternal grandmother or great aunt. They were both married by 1916, and Nigel considers it unlikely that they would have dated a private. He has assumed, therefore, that the soldier was unrelated to his family, and wondered whether we could find out anything more about the postcard, studio, or subject. The photograph is in a postcard format, with "The Empire Studio" (location unfortunately unknown) blind-stamped at lower right, and has the handwritten inscription, "With love, Arnold - July '16." 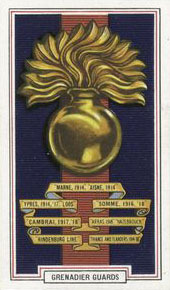 The cap badge is, once again, a flaming grenade. Perhaps the experts could point to a regiment once more, please? Now here is one we can work with! Look at THAT spade shape, and how the bottom of the flames droop close to the grenade. Quite a coincidence, but here's another Royal Fusiliers cap badge. 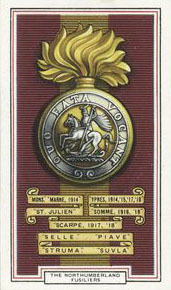 Nigel found some images of the cap badges for many English Regiments, in the form of cigarette cards, on the New York Public Library Digital Gallery. These display very clearly the differences to which George and Harry have referred in previous posts. 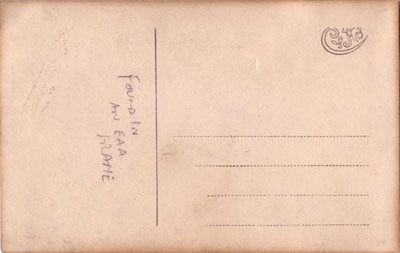 However, the stamp box design gives a clue to the publisher of the postcard stock. CYKO is listed by Ron Playle on his web site "Real Photo Post Cards" as having operated from 1904 until the 1920s. He also shows some variation in stamp box design, which is consistent with the date inscribed, and that suggested by the uniform. Harry, Brett and I have been kicking this around a bit and have come to agree that it is most likely that your first three photo's are of someone who served in the 1st - 4th Battalion, Royal Fusiliers. The fourth (later) photo is definitely Royal Artillery. This view has been reached, given the "Spade" shape of the flames from the grenade and the respective Regimental postings of the HAC and RF's. Only the 1st - 4th Battalions London Regiment wore that pattern of badge - Battalions numbered 5 onwards had a different pattern. Another important clue was the shorts that the two men are wearing - only someone going to tropical climes would be issued with them. From a copy of the Regimental details of the two Regiments - HAC & RF's - you can see that only the 3rd & 4th Battalions, London Regiment went to Mesopotamia - neither the 1st nor 2nd Battalions went there, thought they did go to Malta, that was during the winter of 1914 - 1915. None of the H.A.C. Infantry Battalions went anywhere hot - Northern Italy in the winter of 1917 and that is certainly not hot. Battalions, London Regiment (Royal Fusiliers). Hope that is helpful, Kind Regards, George. Many thanks to Stew for the images, and to Steve, Harry and George for their contributions to this interesting discussion. As advertised by photographers on the reverse of their card mounts, studios offered enlargements finished in oils, watercolours or crayons. Of course, they are not as common as the ordinary cdvs and cabinets, but one does come across them fairly frequently on eBay, and I suspect they are perhaps even more common in family collections. A recent posting included a framed enlargement. The two hand coloured photographic enlargements shown above, with a cabinet card and carte de visite for size comparative purposes only, are from my own collection. They are on roughly trimmed, very thick card measuring approximately 140 x 205 mm and, from the marks at top and bottom, it is clear that have previously been mounted in some sort of frame. Some pencilled notes, only partly decipherable, regarding the colouring of the portrait can be found on the reverse of the first enlargement, as well as what appears to be a negative number (37433). Also written on the reverse, in a different hand, and in what appears to be ball point pen (and therefore certainly not contemporary with the portrait itself) is an identification of the subject: "Robert Hardwick, Died at sea off Farne Islands, Jan 13th 1895, Aged 54." From the style of the woman's clothing, I estimate that the portraits were taken in the early 1890s, perhaps between 1890 and 1893. Although it's more difficult to estimate ages in portraits that have been "doctored" in this manner, I would say that the couple are aged about 50, approximating to the age indicated on the reverse of the first photo. Robert Hardwick was born in Clifton, near Bristol in 1839, son of a mariner Robert Hardwick senior and his wife Catharine. Soon after his birth, the family moved to Middlesbrough in Yorkshire - Robert's father had been born in Robin Hood's Bay, a village near Whitby, where Captain James Cook learnt his trade as a seaman. In 1867 Robert Hardwick junior married a widow, Emma Ratcliff née Wild, and the 1871 Census shows Emma's three children by her first husband (Martha Ann, Thomas Herbert and Rose Hannah) living with them. 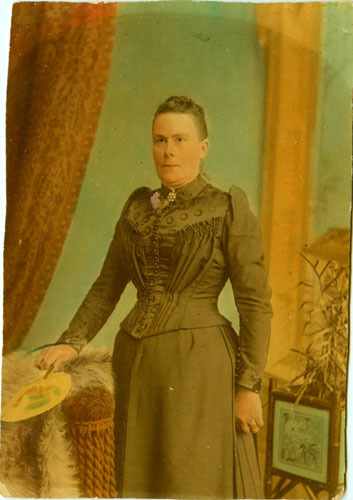 Emma had another five children with Robert: Catherine (Kate) was born in 1864, Emma Elizabeth in 1869, Robert in 1873, Arthur in 1877, and finally John Frederick in 1879. The presence of small corsages in the buttonholes of Robert and Emma Hardwick suggests that they had these portraits taken on a special occasion. Perhaps it was the marriage of their daughter Emma Elizabeth to Ernest Edward Robinson, which took place in Middlesbrough in late 1891. The 1891 Census shows Robert away, presumably at sea. - Charles John, 203 Newport rd. - Phillip & Wright, 75 Albert rd. All three of these premises were with a short distance of the centre of Middlesbrough, and any of them could therefore have been the studio visited by the Hardwicks. I have cropped the cap and collar badges from the photo's on Brett's web-site and believe the crux of the matter is in the shape of the flames above the bomb. 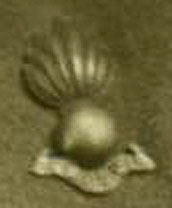 I refer to the book "Military Badges of the British Empire 1914 - 1918" by Reginald H.W. Cox. (1) I do not believe these men have anything to do with the H.A.C. as the H.A.C. 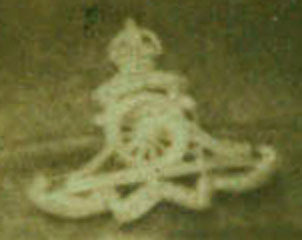 cap badge was similar to the other artillery badges - namely the field gun, but with HAC on a "ribbon" above the gun carriage wheel and under the crown. They did have exploding bomb collar badges, but the shape of the flame was long and narrow and pointed at the top - a bit like the shape of a poplar tree. (2) Similarly, I do not believe that they have anything to do with the Grenadier Guards. According to RHWC's book, GG's did wear the bomb badge, but the flames were VERY rounded across to top and protruded almost twice the width of the bomb itself - the flames were very "flat" looking. (3) Because of the shape of the flames on your photo's, I believe the main contender has to be one of either the 1st, 2nd, 3rd or 4th (City of London) Battalions Royal Fusiliers. After the 4th Battalion, the design was quite different. Having cropped your photo's and blown them up, (no pun intended!) all but one badge on your men had triangular shaped flames coming out of the bomb - a bit like the spade shape of spades of playing cards. I could find no other references to "spade" shaped flames in the book - only to these four battalions of the R.F's. Officer's badges were bronze - O.R's badges were gilding metal. 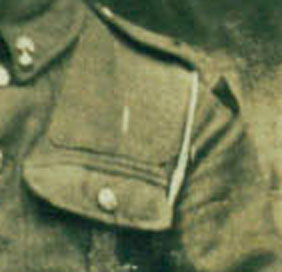 In the continuing debate about the identification of the badges on the cap and collar of a World War One soldier, I would like to refer to an image which featured in a previous posting on this blog. Just to make it clear, this image is of a portrait from my own collection, and has nothing to do with Stew's postcard photographs shown in the previous two postings. 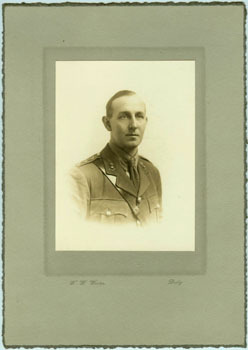 The photo is of a captain of the Royal Artillery (though it could also be any British Commonwealth artillery), as the flames of the very distinctively shaped collar dogs appear to be seven in number, without the two additional shorter flames in the centre that mark the Royal Engineers. He is wearing his pips on the shoulder which means post 1914. (At the outbreak of hostilities, officers wore their rank insignia very prominently displayed on slash cuffs. This, and the Sam Browne belt, made them HIGHLY conspicuous targets - a dangerous thing to do. 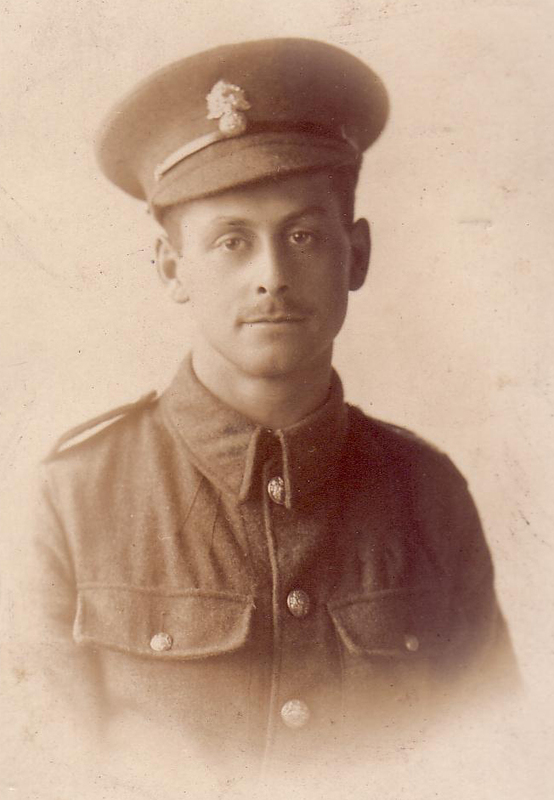 They moved their rank insignia to the shoulder straps and started wearing the field equipment of the men, to make them less visible, the Sam Browne being reserved for formal occasions such as having one's picture taken, as in this case!) Following the war, the rank insignia was changed to brass and the Sam Browne again became an everyday item of dress. Judging by the style of the photo, the hair cut, and the cloth pips, I would say that this officer was of the Great War period. The texture of the tie and the collar style are also, I think, in accord with this period. Notice that he is wearing no ribbons. 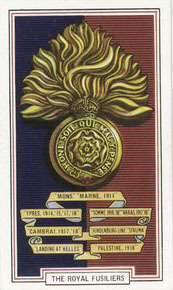 The "general issue" medals, such as the Victory Medal and the British War Medal, were only awarded at the end of the war. The only ribbons worn during the war represented orders and awards for gallantry, the Military Cross being the most common for officers. In comparing the collar dogs, remember that, during the Great War, R.A. officers wore bronzed flaming grenades, with a scroll underneath. The grenades worn by ORs were made of brass and did NOT include the scroll, which was added to their collar dogs much later. I've had some interesting responses to the article and three photographs of a soldier in uniform, and the authors have kindly assented to their inclusion here. The following from Steve Morse, author of "9th (Service) Battalion Sherwood Foresters (Notts & Derbys Regiment) during The First World War, ISBN 978-0-9555698-1-4." "I thought at first the G.Guards but they did not have metal collar badges. 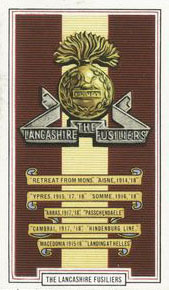 Although the Lancashire Fusiliers did. It is close to the LF badge with grenade and flame. I cannot see any rank for the men either." "As Brett supposed, it is indeed a Great War uniform. Brett thought he might have been a Grenadier Guardsman. I don't think so, as no guardsman would have worn his cap like that. Also, the grenade appears to have some texture, which suggests an embossed design. Grenadier Guards grenades are plain. There is also the white lanyard in one of the photos, which to me says artillery, though not necessarily so. The shape of the cap badge, especially of the flames and their relative size, suggests only two possibilities - Royal Fusiliers (City of London Regiment) or one of the infantry battalions of the Honourable Artillery Company (of London). Numerically, the Royal Fusiliers stand the best chance, as they raised more than fifty battalions (a remarkable number!) during the course of the Great War. But there are aspects of the uniform, in the photo of your man and his chum, that suggest he was NOT a fusilier. First, there is the white lanyard, which appears to be not unlike one worn in a photo of the same vintage of my uncle, who was a gunner. Second, there are the collar dogs, which are the right shape for Royal Artillery other ranks of the period (the scroll underneath was worn during that period only by officers). Note that the shape of the flaming grenade on the collar dog appears to be different (more elongated) from that of the cap badge. The H.A.C., in the Great War, raised seven artillery regiments and three infantry battalions. I wish I knew if their ORs all wore the same (artillery pattern) collar dog, but I don't. Nor do I know what the Royal Fusilier collar dog of this period looked like. My guess is that your man was a member of one of the H.A.C. 's infantry battalions, but I can't be sure from these photos. 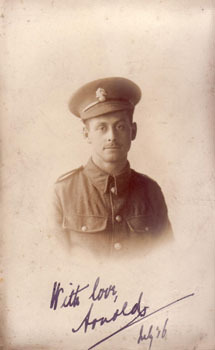 The thing to do now is to go to the Great War service records and try to find him. I would be most interested in what you find." 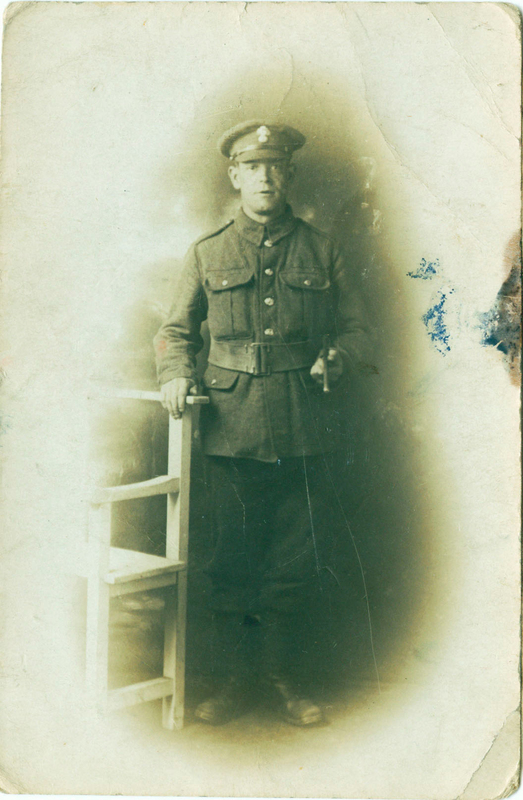 "I was able to find in the war medals possibly my man as a bombardier in the royal garrison artillery ... he had a Victory medal, British medal and a silver war badge, which would fit with the photo of him injured. 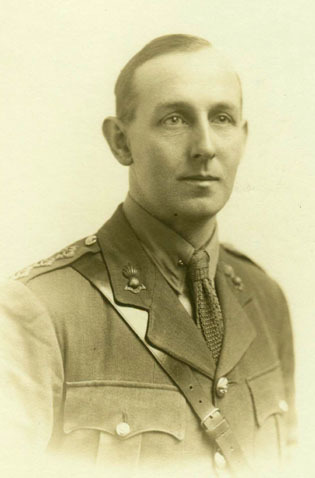 Taking all of this into account, I have dug out another photo - not sure if it is the same man, he is much younger but if you agree would like to send it to you to see what is thought of it, as to regiment, rank if anyone else thinks it could be the same person." 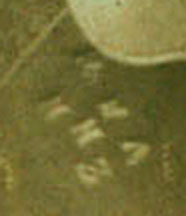 Click on the image shown above for a more detailed scan of the photograph. I have included enlargements of the cap badge and the letters stamped on the bandolier, for those who may be able to identify them. Many thanks to Stew for the images, and to Steve and Harry for this informative discussion. 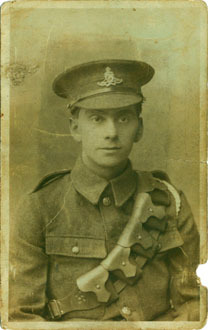 Stew sent me these images of a soldier, for which he would like the regiment identified. Can anyone help him, please? Click on each photo for a more detailed scan. 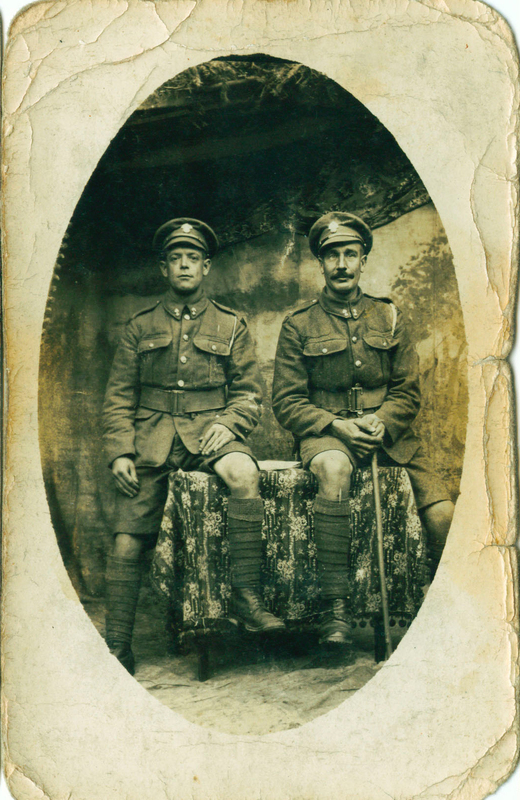 They seem to me to be from the First World War, and I believe the cap badge may be from the Grenadier Guards, but I'm sure that the fundis out there will be able to give chapter and verse. You are welcome to post your comments here, by email to me, or to the Derbyshire Mailing List.